What’s the latest buzz in the sign industry for sign shop owners? The new HP R Series of rigid and flexible substrate printers. The new HP series of latex printers bridges the gap with rigid and roll flexibility and expands client offerings to many sign shops. HP’s R Series also offers white ink printing on rigid substrates like wood and acrylic, with one of the glossiest whites available to the sign industry. 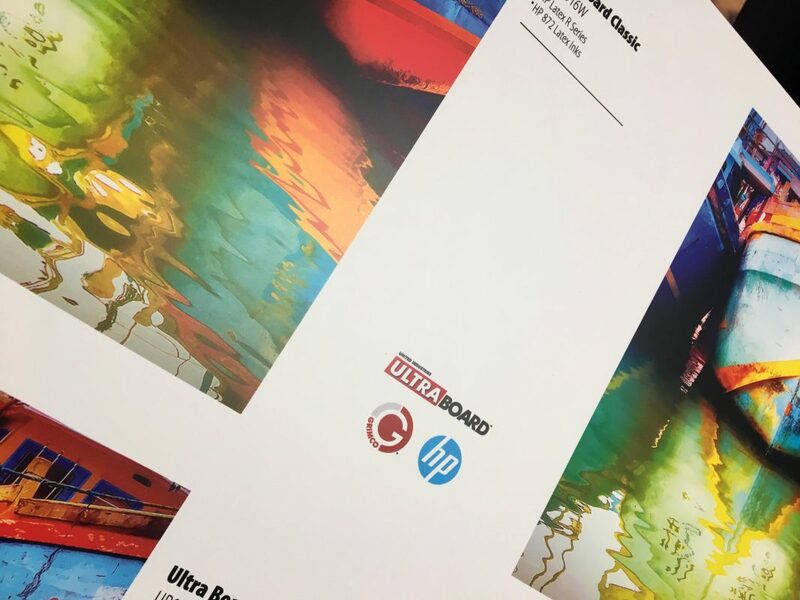 We were ecstatic to get our hands on the new HP R series latex printers at a recent Grimco Open House at their Demo Center in Long Beach, California- and the results were fantastic! As you can see above the HP R1000 Plus Latex printer produces excellent print results and color reproduction on our 3/16” white UltraBoard Classic foam substrates. The HP 872 Latex Inks reproduced vibrant, sharp and durable images utilizing the HP R1000 rigid sheet print function. To learn more about the HP R Series of latex digital printers visit the HP site by clicking the link below. This entry was posted in Commercial Signage, Digital Printing, HP Latex Printers, Industry News, Large Format Printing, Retail Signage, Sign Business, Substrates and tagged HP Latex Printers, latex ink, latex printing substrates.